My personal favorites are when Sora sacrificed himself to save Kairi and when Sora got on his knees and begged to Saix to be taken to Kairi. Mine is when they are first reunited at The World that Never Was. That whole thing is so cute! She jumps off a fricking balcony to get to him, and then they have that adorably awkward moment before they hug! It just doesn't get cuter! Oh wow, where to start? - The Halloween Town dancing dream! Honestly, I think I love every scene that involves Sora and Kairi together. Their relationship was what got me hooked on KH in the first place, when I wondered how and when he was going to find her after they got separated. I'm hoping we'll see even more interaction between them in KH3! Nearly every scene that has them 2. Mostly TWTNW because they hugged. (Sadly no kissing.) Sweet. I was so excited for that part all throughout KH2! When Kairi ran up to the edge of the balcony and called out to Sora, I thought, "YES! They're finally together again!" - When they sat together at the docks, watching the sunset together. I think Kairi's trust in Sora showed in the fact that she was willing to admit her misgivings, and at the same time, seeking reassurance ( "I know I can always come back here. Right?" ). - When she gave him her good luck charm, of course, and how he tried to keep away from the danger. He was so embarassed! - At Hollow Bastion, when she was willing to let the heartless attack her, because she didn't want them attacking Sora. - I loved it when Sora was begging Saix to take him to Kairi. Even willing to get on his hands and knees, despite his pride! Now that's love. - Of course, when they reunited and the awesome hug scene happened. <3 His eyes became so tender when he looked down at her. Not to mention, despite his pride again, thanking the guy (Ansem SoD who ended up being Riku) that he despised so much, because he saved Kairi. Reika wrote: - When they sat together at the docks, watching the sunset together. I think Kairi's trust in Sora showed in the fact that she was willing to admit her misgivings, and at the same time, seeking reassurance ( "I know I can always come back here. Right?" ). That's something I like about them too- it shows that they trust each other and that's very important for a stable relationship. That one actually gets me feeling a little choked up, probably because I feel so sorry for Sora! He's all excited, thinking he's found Kairi, and then he turns around and she's vanished! Reika wrote: - I loved it when Sora was begging Saix to take him to Kairi. Even willing to get on his hands and knees, despite his pride! Now that's love. It IS love! It's even more significant when you think about what he was saying: "Take me to her." Not, "Let her go." No, he said, "Just let me into the Realm of Darkness, okay?" That would be a VERY risky thing to do, because if Saix complied, there would be a very strong chance that he'd take Sora to the dungeon on the pretense of letting him see Kairi, and then locking him up with her. 'Cause Sora made no mention of wanting Saix to give the couple a free pass out of the World That Never Was. All he cared about was seeing her. And he was willing to get down on his hands and knees and beg Saix to let him do that. Talking about dearly loving someone! Reika wrote: Not to mention, despite his pride again, thanking the guy (Ansem SoD who ended up being Riku) that he despised so much, because he saved Kairi. Awww, I forgot about that! "Hi, I know you're my dreaded enemy, but you saved Kairi, so let's be friends!" Reika wrote: - And he was willing to get down on his hands and knees and beg Saix to let him do that. Talking about dearly loving someone! That is another one of my favorite parts! Honestly, he begged! How can people say that Sora doesn't care for Kairi when he was willing to put his pride aside and kneel at his enemy's feet to see her? Organization_42 wrote: That's something I like about them too- it shows that they trust each other and that's very important for a stable relationship. Exactly. Not to mention, Kairi had to have quite a bit of faith to believe that Sora would come back to her ( "I'll come back to you, I promise!" "I know you will!" ). She had faith in his ability to return to her. Organization_42 wrote: That one actually gets me feeling a little choked up, probably because I feel so sorry for Sora! He's all excited, thinking he's found Kairi, and then he turns around and she's vanished! Organization_42 wrote: It IS love! It's even more significant when you think about what he was saying: "Take me to her." Not, "Let her go." No, he said, "Just let me into the Realm of Darkness, okay?" That would be a VERY risky thing to do, because if Saix complied, there would be a very strong chance that he'd take Sora to the dungeon on the pretense of letting him see Kairi, and then locking him up with her. 'Cause Sora made no mention of wanting Saix to give the couple a free pass out of the World That Never Was. All he cared about was seeing her. And he was willing to get down on his hands and knees and beg Saix to let him do that. Talking about dearly loving someone! Very true. 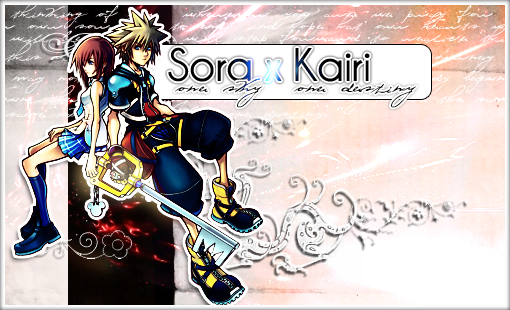 He knew how dangerous it would have been, yet he was willing to make the sacrafice if it meant he could see Kairi. Talk about devotion. Threw away his pride in the hope that maybe, just maybe, Saix would have mercy and allow the two to meet. Organization_42 wrote: Awww, I forgot about that! "Hi, I know you're my dreaded enemy, but you saved Kairi, so let's be friends!" I love that scene, it shows just how much Kairi meant to him, if he's willing to forgive his enemy enough to thank him, especially when you think about all the crap Xehanort/Ansem SoD put him and his friends through. Every scene the two of them had together.